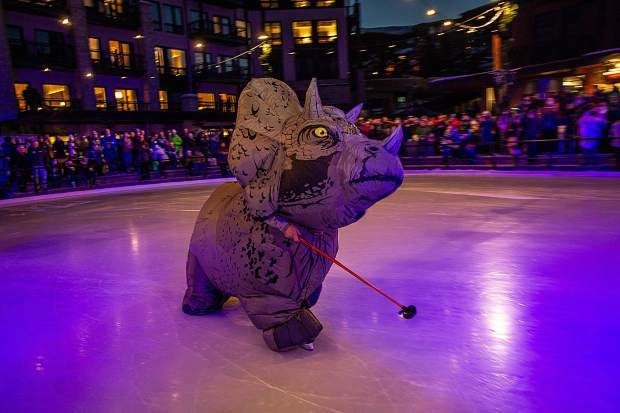 A triceratop dinosaur skates on the new ice rink at the Snowmass Base Village grand opening on Saturday. Ashley Clark performs with fire at the Snowmass Base Village grand opening Saturday night. 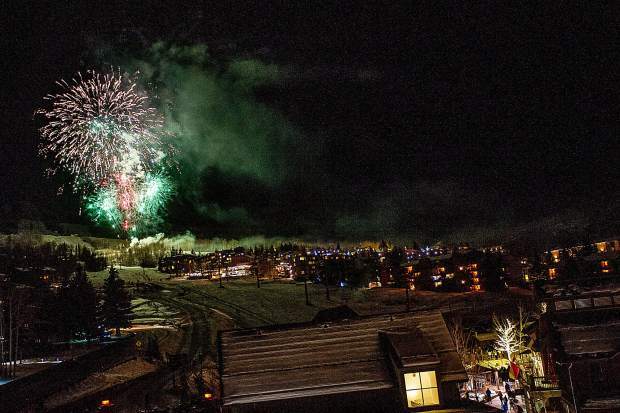 Fireworks shot over Fanny Hill Saturday evening for the Snowmass Base Village grand opening celebration. Olympic figure skater Paul Wylie performing on the plaza ice rink at the Snowmass Base Village grand opening Saturday night. 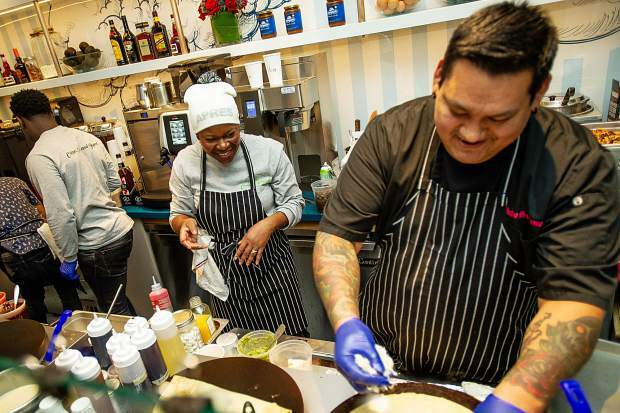 Mawa McQueen and her chef Julio Suriano have a laugh opening night of her crepe shack in Snowmass Base Village on Saturday night. 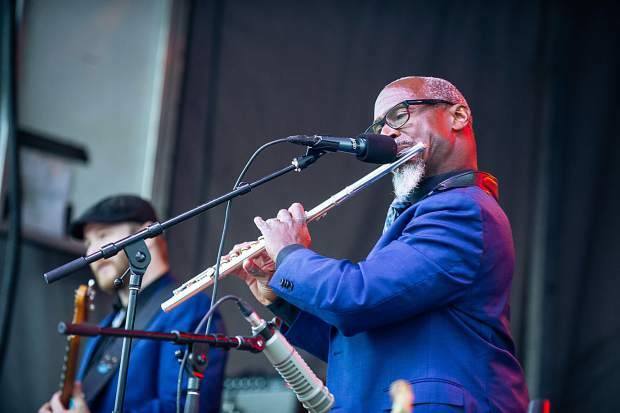 Karl Denson's Tiny Universe band playing the Bud Light HiFi concert at Snowmass Base Village on Saturday afternoon. 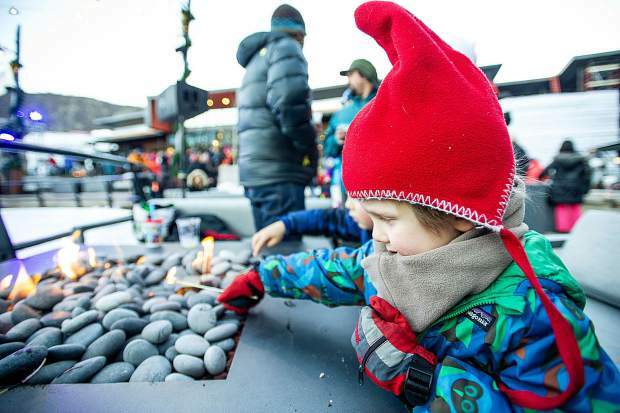 Spencer Sinclaire, 3, lights his marshmellow stick on fire in the plaza at Base Village in Snowmass on Saturday. A rock climber ascends the wall on the Limelight Hotel in Snowmass on Saturday night. 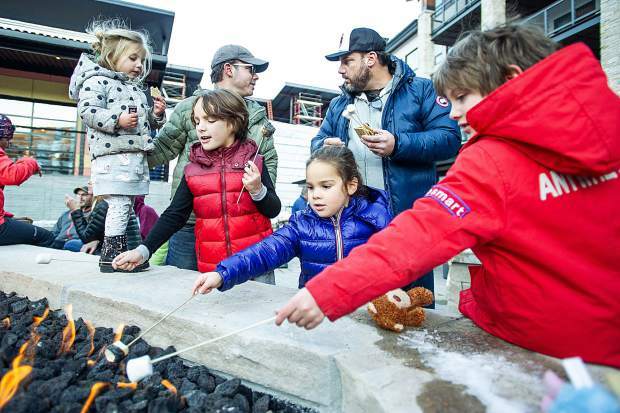 Right to left, Jagger, 7, Chloe, 4, Jack, 7, and Mila, 3, roast marshmellows Saturday at Snowmass Base Village. 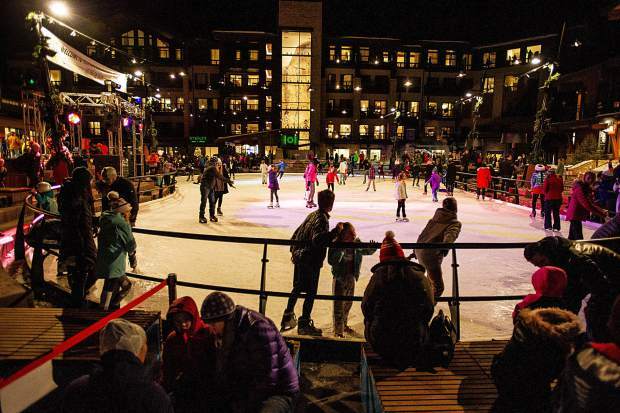 Skaters enjoy the ice rink in Snowmass Base Village Saturday night after the performances for the grand opening. 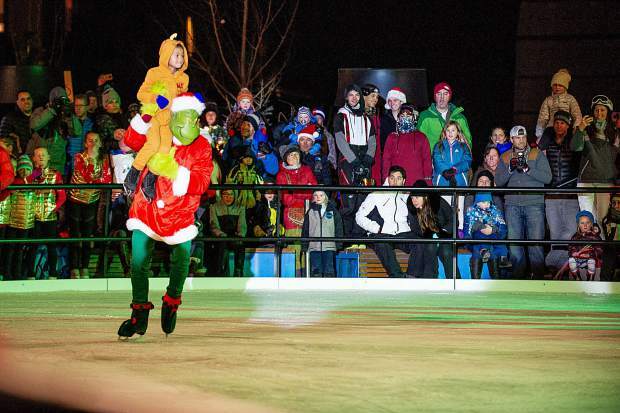 The Grinch or Kelly Smith performing as The Grinch Saturday night in the Snowmass Base Village plaza. 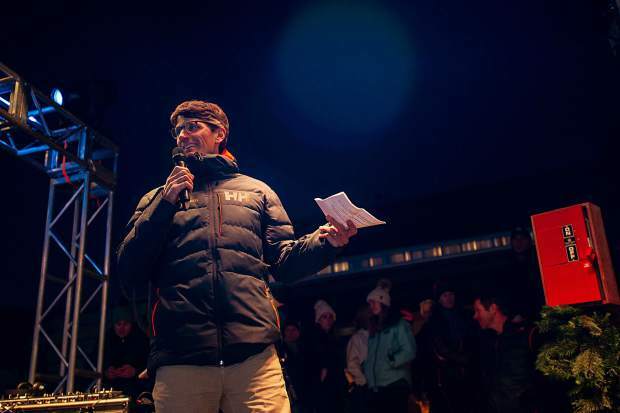 Aspen Skiing Co. CEO and President Mike Kaplan speaking at the Snowmass Base Village grand opening Saturday night. A few thousand people — many who even ventured past Aspen’s roundabout — swarmed to Snowmass on Saturday to celebrate the grand opening of a project nearly two decades in the works. 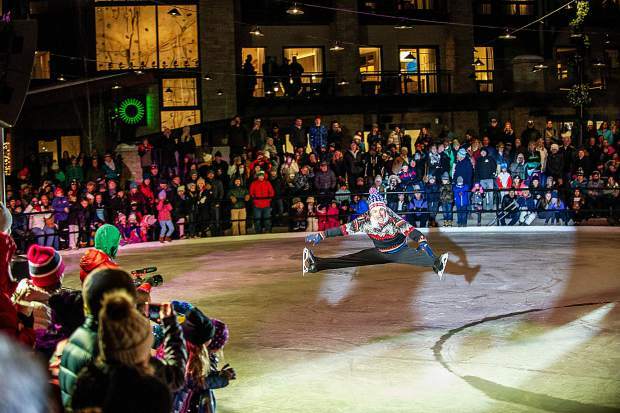 Base Village began buzzing mid-afternoon as the fresh, new Limelight Hotel opened its doors to the masses, and a bevy of skaters showcased their talents to christen the ice rink. The Aspen Skiing Co. initially purchased the base property in 1999. 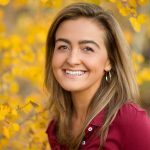 Butler, who served on Snowmass Town Council prior to her tenure as mayor, has been a part of the Base Village conversations since construction started in 2005. Skico and its partner, Intrawest Corp., sold the incomplete development to Related WestPac in 2007. From the economic downturn until the end of 2016, the financially plagued project remained stagnant, and an eyesore for Snowmass. However, since Skico, East West Partners and KSL Capital Partners bought the $600 million development in December 2016, cranes have been in motion and crews have worked onsite seven days a week to ensure that Snowmass’ base area would soon light up exactly as it did Saturday. During a groundbreaking for Base Village in July 2017, Kaplan quipped that it was not his first for the development. While Kaplan recalled about 10 Base Village ribbon cuttings over the past 11 years, he said that Saturday’s event felt different. “This one is the culmination of so many of those things. … Finally, all the pieces have come into place,” he said. As the sun faded Saturday and the temperature dipped, the energy around the plaza center sustained into the evening as people of all ages enjoyed live music, warm bites and libations and a chic holiday pop-up housed inside The Collective. 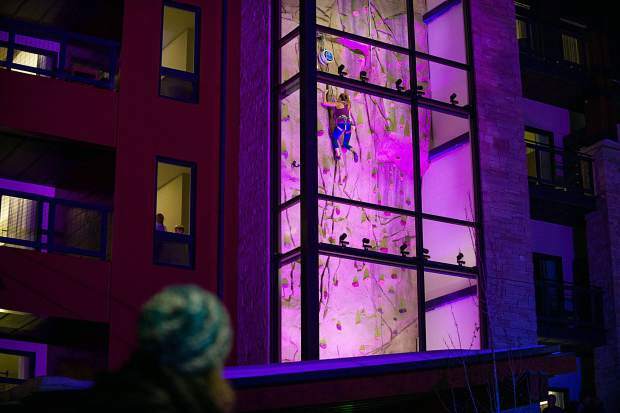 Karl Denson’s Tiny Universe also played his jazzy tunes as part of the Bud Light Hi-Fi Concert Series, a pair of local climbers put the Limelight’s new five-story climbing wall to test and fireworks illuminated Snowmass’ starry sky. Every unit of the 99-room Limelight Snowmass was booked Saturday, the hotel’s general manager, Lindsay Cagley, said. At $159 a night, Cagley said occupancy is still strong throughout next week. 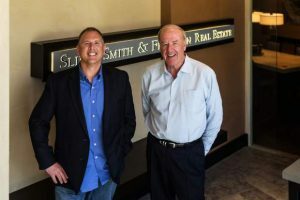 The Snowmass property is Skico’s third Limelight Hotel, with one in Aspen and another in Ketchum. 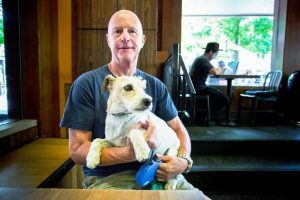 The company hopes the hotel’s lounge area will act as a living room for the community, drawing in locals and visitors. In the 10 days leading up to the Limelight’s opening Friday, the hotel hosted scores of “practice guests” — primarily Skico, East West and town of Snowmass staff — who stayed overnight and detailed the experience before checking out. 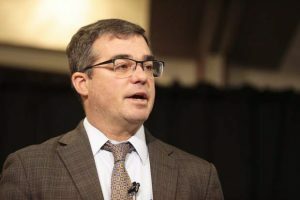 “It’s a dream to have the opportunity to do that,” Cagley said. “It might be in the mountains, it might be a non-ski destination,” Kaplan offered. “But it will be some place that’s cool, that’s got a great walking center sort of town. It’s got to have some great outdoor recreation opportunities. Kaplan said Skico applied its lessons learned from its previous Limelights to Snowmass, particularly in the lounge area. Building 7 will be complete next summer and Building 8 prior to the 2019-20 ski season, according to Gunion.